Summer isn’t complete without the best above ground pool. There’s nothing better than kicking back after a day’s work by floating around in your backyard. Not having to drive to the beach or community pool will make your life easier and more enjoyable. You’ll find that the best portable pool will not only make your family much happier but also increase the amount of time you get to spend with them. With that being said, finding the best above ground pool can be challenging. Above ground pool reviews agree that there are many factors you’ll need to consider before purchasing your first pool. We have done all the hard work and research and have come up with the top above ground pools on the market. This is another one of the top rated above ground pools on the market. Just like all of Intex pools this one has an ultra strong frame which is made from powder coated steel. This makes them not only one of the strongest materials used in pool construction but also able to withstand dents, dings and rust. The outer material has a grey color which allows the water to heat up a little. This pool also comes with a pump that is clear so you can see when it becomes dirty and needs to be cleaned or replaced. From the time you get this pool you will be able to jump in within an hour. Like most Intex pools this one has a dual suction outlet that makes the water constantly move. This will increase the water hygiene and not let bacteria build up in the water. There is also a ladder system that makes getting in and out of the pool as easy as possible. This is a higher capacity pool, rated at nearly 7 000 gallons. It comes with everything you need to get setup right out of the box. You will find a ground cloth, debris cover, ladder and a setup DVD in the shipping package. Intex is a leader of the above ground swimming pool industry. Every single one of their vast options is not only made strong, but has also been rigorously tested and superiorly designed. 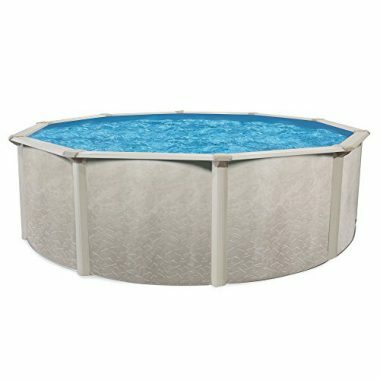 This option is a 15 foot round pool that also comes in a 12 foot and 18 foot option. This package also includes a filtered water pump, ladder, ground cloth and debris cover. The filter is rated for 1 000 GPH and runs off 110 - 120V outlets. There is also a step by step DVD that will show you how to set up and maintain your pool. This also includes how to drain your pool when you’re done for the season which is done simply by attaching a regular garden hose to the drain plug. What makes this the best above ground pool is that Intex has developed a dual suction system which moves the water around in the pool. This will stop bacteria from forming allowing you to swim later into the season without draining and cleaning the pool. This is an above ground inflatable pool for adults. The top of the pool inflates and then rises with the water when you fill it. This is one of the easiest pools to set up and can be ready within 15 minutes. All you have to do to get it ready is lay it on the ground, inflate the ring and use your hose to fill it. Once there’s 3736 gallons of water in the pool you can jump in and enjoy. 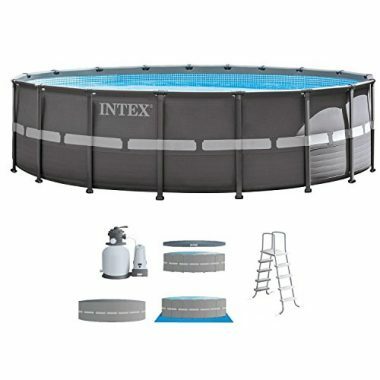 Just like other Intex swimming pools, this one comes with a ladder, ground cloth, water pump and debris cover. It doesn’t have the steel reinforcement but instead uses a laminated PVC material to hold the water. When you’re done for the year you can simply attach a garden hose to the valve and it’ll be drained in nearly no time at all. Summer Waves is another great summer pool company. Their products are top of the line and include some ingenious designs. 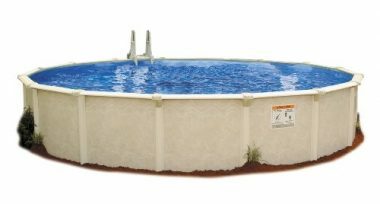 This option is a round above ground pool with a diameter of 16 feet. 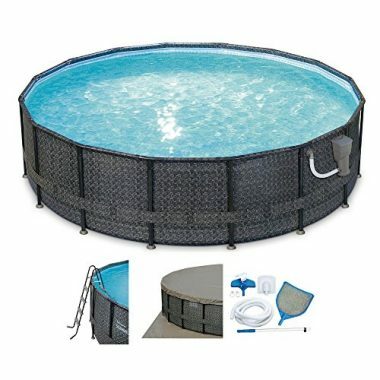 It has a metal frame that ensures your pool will stand up to Mother Nature and abuse from your family. It comes with a 1500 gallon filter pump system which ensures your pool will be filled with clean water for the entire season. No longer will you have to drain your pool to keep it clean. The package it comes in is complete with everything to get you up and running. It includes the filter pump, pool cover, ladder, ground cloth and even a deluxe maintenance kit. Once you have the outer shell setup you just need to add the water (5246 gallons) and your family will be cool as can be. If you are a fan of rectangular above ground pools this is one of the better ones. 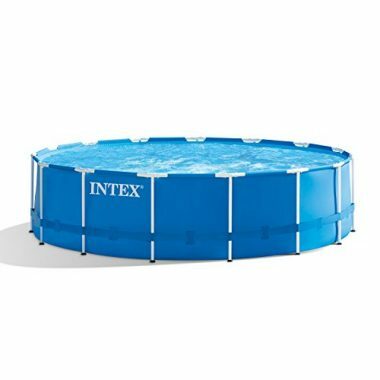 Intex has one of the best above ground pool sidewall support systems on the market. This one also has powder coated steel bars that connect with the top of the pool. They encase the sides which don’t allow them to flex or bend in any way. This is combined with laminated PVC sidewalls which is one of the best materials for a pool. Since this has quite a high water capacity (14, 364 gallons) it takes a little longer to get up and running (90 minutes). There is an easy to follow DVD which will make the setup of this pool easy. You will also get the standard package of goodies when you order this pool. This will include a ladder, ground cloth and debris cover. But with this pool you also get a deluxe pool maintenance kit and even a volleyball set. Your house will become the gathering point of your friends and will be playing volleyball matches all summer. 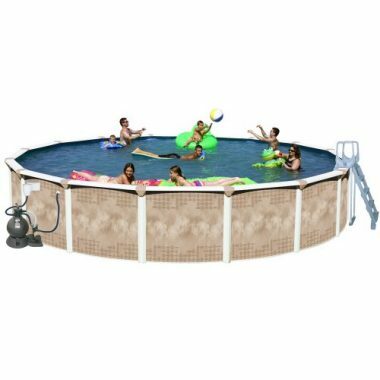 Splash Pools offer 3 different sizes of their round pool: 18, 24, and 30 feet in diameter. Each option is 52 inches off the ground meaning adults can touch the ground while younger children may not. The sidewalls have been made with hot dipped G-90 which gives a multi layered protection system. There is also a 7 inch galvanized steel ledge where you can put your drinks and toys. The resin ladder is able to be lifted off so you can control who enters and exits the pool. This package includes a 1 hp pump and motor to keep the water fresh and clear. You will also be able to set this up in nearly no time by following the included step by step installation video. This is a large above ground pools. It spans 30 feet by 15 feet while rising 52 inches above the ground. This is truly one of the larger above ground pools you can buy. It has a large 7 inch painted galvanized steel ledge that you can put drinks and rest your legs on all while floating in the water. You can easily climb up to get in the water with the included heavy duty resin ladder. It features an anti-entry staircase that can be used to keep small children from climbing up unsupervised. The pool will also stay clean thanks to a 19 inch sand filter and 1 hp motor. This will ensure that all of the debris that gets brought into the pool gets filtered out quickly ensuring you have crystal clear water. What makes this ground pool stand out is its build quality. Heritage Products know their pool is made to last, this is why they include a 25 year warranty on the pool structure. If anything happens to it simply get in contact with them and they’ll fix it. But the chances of the Perma 25 Series all weather vinyl needing to be repaired is quite slim. 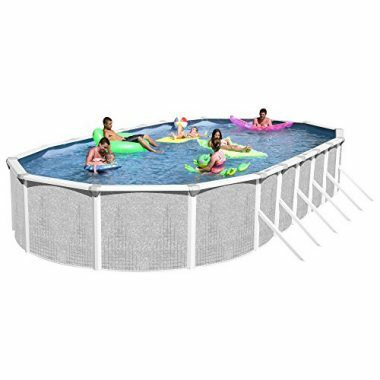 The ground pool is reinforced by a Hot Dipped Galvanized G-90 steel wall with a steel frame assembly that has been zinc coated. If you have a smaller yard and are still looking for a summer pool, this is a great option. It has a total footprint of 8.5 feet x 11.5 feet which allow you to install it in a small space, even a basement or garage. With that being said, it is a fully equipped setup. It has been designed for exercise allowing you to swim and tread water. The pool creates a jet stream of water which you can swim against. This mimics swimming in a lake or river and can be adjusted with ease. Swimming has been proven to be an excellent way of exercising and now you can do it from the comfort of your own home. 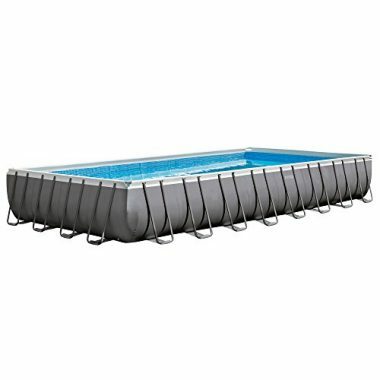 The iPool D has a zinc coated galvanized steel frame that can support the weight of the water with ease. The liner is made from a 5 layer vinyl coated polyester weave which is used in artificial lake beds and even river rafts. Fitmax has created a way to reduce the tension on the sides of the pool with an easy to use knob. This package comes with a ladder, 2500 gallon per hour filter pump, floor sheet, repair kid and vinyl cover. But what makes this package so great is that it comes with a 5.5kw heater. This means you can even use it in the winter! It will heat the water so there is no worry of the water freezing or being too cold to swim. Wilbar International have designed a unique above ground pool. It features a 52 inch corrugated steel wall instead of vinyl siding. When this is coupled with 6 inch steel top rails, 5 inch steel uprights and steel bottom tracks and place, you have a nearly indestructible pool. This is such a well designed structure that the company includes a 10 year limited warranty. Not only that, it is one of the larger round above ground pools on the market at 24 feet in diameter. The inside of the pool has a 100% virgin vinyl liner which not only make the inside nice and soft, but also adds color to the water. It even has a pebble and seashell pattern on the bottom so it looks like you’re in a lake or ocean. Embassy Pool Co have another top notch pool. Their above ground pool option is an 18 foot wide and 52 inch high option. It uses baked enamel steel and 9 inch wrap around top rails to secure the liner. 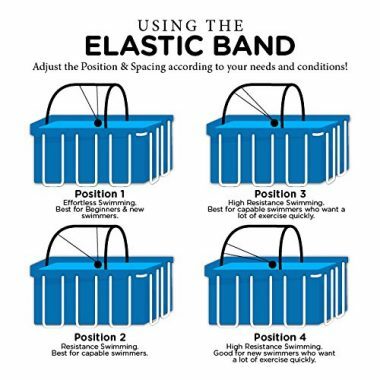 It does this by having a corrugated wall that adds not only flexibility but also increases the pools overall strength. A 17 inch sand filter and 1 hp PR omega pump ensure that this pool remains clean and ideal for swimming. It also comes with a durable platform ladder that has railings to help you climb into the water. An HD liner also keeps the ground separate from rocks or other sharp objects. This pool even comes with a pool vacuum. Deciding to put the best above ground pool in your backyard can be very exciting but it is important to think past the emotions to ensure that you get everything you want in your pool. There are important things to consider before buying the best above ground pool. An above ground pool is one that is freestanding on top of the ground or only a few inches deep. This is different from the permanent style built-in pools as they require much less maintenance and an easier installation. These above ground pools are designed to have a semi-permanent standing that is left up all year round but can be removed if needed. This style pool typically has a thin rigid wall that is held together by metal pipes on the top and bottom. Most typically these metals are either aluminum or resin rather than steel which makes them saltwater compatible. This style of pool requires equal pressure to be placed on all sides and therefore come in a round shape. At times, you may find above ground pools with an oval shape. You may be wondering what are the benefits of an above ground pool rather than a built in pool. While built in pools tend to be bigger and bring up your houses market value, there are many advantages to above ground pools as well. By far the largest benefit of an above ground pool is the affordable cost associated with it. This is not simply due to a cheaper installation cost but they are also much easier to maintain than bigger in ground options. The cost difference reaches all aspects of this purchase. You will not have to pay for the initial digging of the pool or the tiling. The chemical costs will be much less on a smaller swimming well as it will require much less maintenance equipment. This style of pool doesn’t simply have a more affordable initial cost but will also cost you far less on a year to year basis. Affordability is important and if you can have a pool that meets your budget, you will be much happier with the purchase of your new above ground pool. The technology in above ground pools have come a long way and you can now get a high quality pool without paying a huge price. This makes an above ground pool even smarter investment than ever before. In recent years the popularity of these above ground pools has skyrocketed and therefore the design has far surpassed ever before. These high quality structures now have many desirable features. Fitness lovers will love a pool with a water treadmill feature to help them to swim laps to perfectly combine recreation with fitness. Other swimmers may enjoy a pool featuring waterfalls or fountains to increase their experiences. Some above ground pools are even deep enough to feature diving boards and other exciting features to make your backyard space even more fun and exciting. The above ground pool system is often much safer which increases their appeal. As you will have to use a ladder in order to climb inside you will have much less risk of children and pets falling into this above ground pool accidentally. This is an important safety feature for your family as it will make your home and backyard a much safer place. You can even cover this style of pool much easier when it is not in use making it a much safer option. Nearly all of the above ground pools these days come with features that make maintenance as easy as possible. All of the best above ground pools come with filtration systems that clean your pool as you swim in it. You will find that most of the pumps come with a clear outer shell which allows you to easily see the state of the filter. No longer will you have to guess if it’s time to change the filter. You can simply look down and see if your filter is dirty. This is one of the biggest advantages to above ground pools. The installation is much simpler on this style of pool as you will not have to dig deep into the ground. This can be installed quickly and without the use of a construction team. This is not only easy but can be done in an afternoon. The smaller size allows more people with smaller yards to have access to this style above ground pool. Above ground pools use a lot of different materials for their construction. 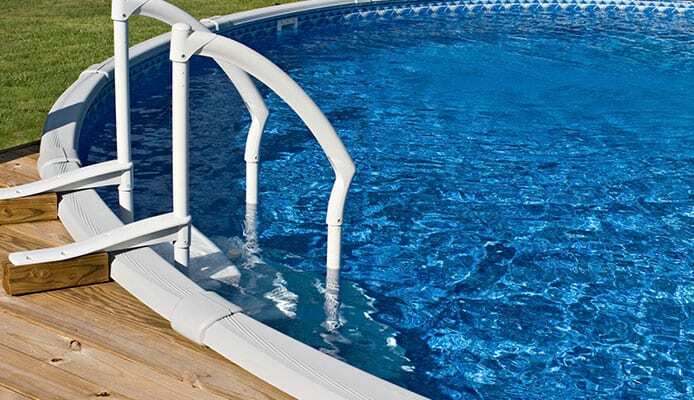 Nearly every single pool will have a liner that is made from vinyl. This will make a smooth and soft barrier between the outer material and your skin. The outer shell of the above ground pool can be made from many different types of material including steel and aluminum. The key is to have a strong and durable yet lightweight skin that makes setting up the pool easier. Most above ground pools will also come with a support system. This further reinforces the pool and makes the walls more rigid. Companies will use tubular steel with a coating that ensures they can stand up to rust and the elements. Above ground pools come in packages that have everything you need to get setup. Packages will typically include a pump, ladder, ground cloth, debris cover and instructions on how to set it up. All of these items will be one less thing you need to purchase in addition to your pool. The pump will include a filtration system which will keep your the water clean and free of debris. 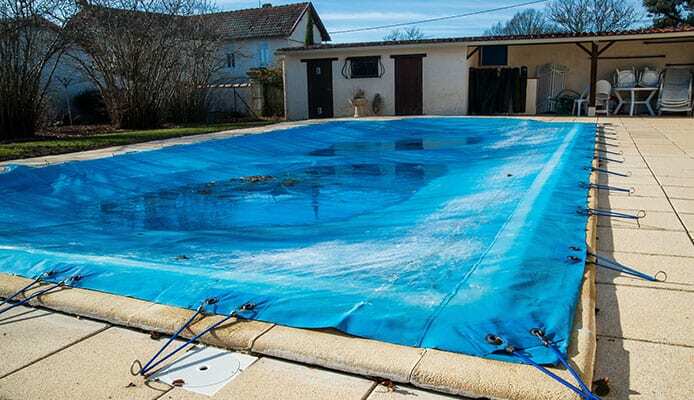 A ground cloth will add an extra barrier between the bottom of your pool and the ground. This will extend its life and keep it clean. The debris cover should be used every night so that leaves and other items don’t enter your pool as it can clog the filtration system and pump. A ladder will also be necessary and will usually be able to be removed or folded up. This will ensure you have control over who enters the pool. You don’t want a small child climbing into the pool unattended, for example. Most companies will include a video or even DVD with instructions on how to set up your pool. It’s important to watch the entire video, or read the instructions before you start this procedure. Missing a step can make your pool unstable. Having the best above ground pool is a great way to spend the summer. You won’t have to travel long distances to cool off or have a good time. These bodies of water can be great to exercise in. Some above ground pools even offer resistance that can simulate swimming long distances. Different shapes will also let you use them in different ways. A rectangle pool, for example, will give you the ability to swim laps or even set up a volleyball net and have a match. These are also great for simply floating in a blow up toy. If you are the type of person who likes to read you can grab a book to read while you float and dangle your feet in the water. Your kids will love being able to have their friends over to swim after school or on the weekends. They’ll be able to play while you relax outside. If you are looking for a more permanent pool you can invest in some decking and build an extension of your home’s deck. This way you will be able to walk outside and jump in the pool. You can even set up your barbeque nearby and have summer parties in style. There are two main functions of water circulation in a pool. First is to keep your water flowing and the other is to evenly distribute the chemicals throughout your water. There are a couple different parts to your pools circulation. These include the pool filter, the pump, skimmers, drains and returns. All of these parts work together to create your pools circulation system. The primary purpose of this system is to ensure that the water in your pool remains safe and healthy. To do this, first the water is pulled out of the pool by the pool skimmers. The water moves through the skimmer basket which is your first line of defense filtering out and large pieces of debris. This commonly works to stop items such as leaves and other large materials. Following this stage, the water then moves through the filter. This is where all smaller items that weren’t caught by the skimmer basket gets removed. In this stage your water may become heated and treated at this stage depending on your pool type. Lastly, your clean water will then be returned to your pool and the cycle continues. This process provides you with a cleaner water that your family can safely swim in. While water circulation helps to clear out any debris floating in your pool, it will not efficiently kill any slime that accumulates on the sides and bottom of your pool. To help solve this, you are best suited with an automatic pool cleaner. In today’s market you will be able to enjoy and choose from a number of different types of above ground pools. Most commonly you will find easy set pools. This type features a metal frame that is incredibly sturdy and durable. They typically have either PVC or soft vinyl walls. Inflatable rings sit on the tops and work to lift up your pool walls and lift up the walls as you begin to fill it with water. Alternatively, you will find metal framed pools. These are much sturdier and can hold up much more water. They come in different pool shapes and are much more durable. This type features steel bars that work to support the pool liner. The size of your pool will be determined by two main factors: the size of your family and the size of your yard. If you have a larger family who all want to be in the pool at once you will have to get a larger one to accommodate them all. But at the same time, you will want to consider the size of your yard. If the pool has to be up against a fence to fit in your backyard you will want to consider a different size or even shape pool. Pools can come in a few different shapes. The most common ones will be a circle or rectangle. You will want to think about how you’ll use the pool. For example, if you are wanting to swim laps you will want a rectangular shape. But if you are simply wanting to lounge in a floaty a round shape will serve you just fine. Round above ground pools will generally take up less space, but you will be able to fit more people into a rectangular option. Square above ground pools are another option that can make it easy to lounge without taking up too much space in your yard. All pools will come with a detailed list of instructions about how to set it up. This process can take anywhere from 15 to 90 minutes to do. If you do it yourself you will save time and money while learning the ins and outs of your pool. You may need up to 3 people to install your pool. Most can be setup with a single person but can take much longer than if you have a team willing to help. You will not want to put your pool on unstable ground like sand or loose dirt. We also suggest avoiding slopes or rocky ground as it can cause the pool to shift or even puncture the bottom. If at all possible we suggest finding a place that doesn’t have grass as it can grow into your pool or create a dead spot in your yard. If your yard is particularly sloped you will want to create a level place to put your pool. This can be done by creating a platform for your pool out of wood or paving stones. Or you can dig a flat part where the pool will sit. You will want to ensure that the ground around and under your new pool has proper drainage. This is important because otherwise your pool could cause water to collect within your yard. This is a much easier thing to prevent rather than fix after the fact so be sure to be mindful of this before you install your new best above ground pool. Before beginning the process of laying your foundation for your new pool you will want to consider the material you will use. Clean sand works well for this type of pool as it adds a layer of protection between your pool and the ground. This will work to prevent against roots and rocks piercing your above ground pools bottom. You will want to choose between patio blocks or stones for this part. Sink them into the ground and use this to support your posts. You can do this by placing them below the buttresses and posts of your pool. You will want to make sure that all of your blocks remain level. Once your foundation is secured you are ready to begin assembling your pool. How you do this will vary based on the pool that you have purchased so make sure to pay close attention to the manufacturers manual that comes with your unit. The Cove refers to a 6-8 inch wedge of sand that is built around the edges of your pools walls. 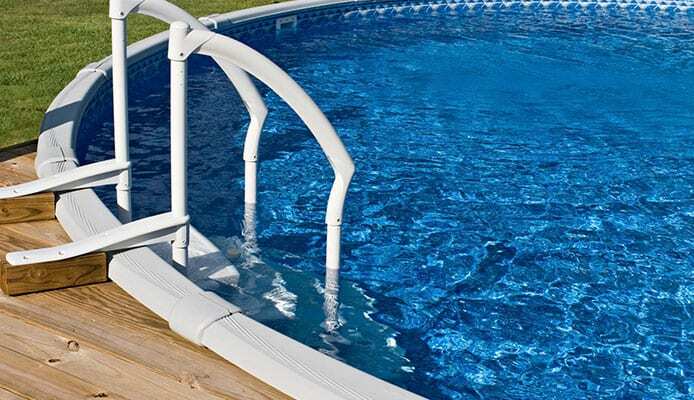 This offers a protective layer between the metal frame and your pools liner. This also works to prevent the liner from slipping. Before going any further, you will want to thoroughly inspect your above ground pools liner. Do this by spreading it out and inspecting for any holes or tears. In this time allow the vinyl to heat naturally with the sun. This will make it much easier to maneuver. Once warmed, you can install the liner. Be sure to use extra care in this step ensuring that there is no air remaining between the liner and the ground. For your final step before adding water, you will want to smooth over the surfaces of the pool by gently pushing it towards the wall. Once you have completed this step, you are ready to fill your above ground pool up and begin to use it. Be sure to choose a spot that is away from the action in your yard. This will make your pool less of a hazard. 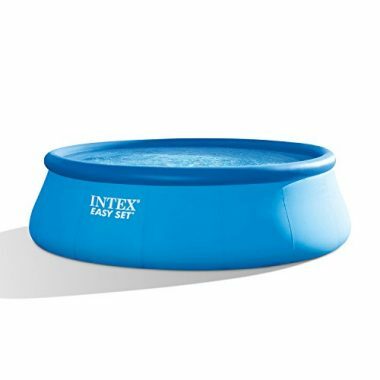 Families with pets or small children will appreciate that this pool style is much safer as it poses less risk of falling into. Additionally, being able to easily cover the pool when not in use works to make it safer for your family. Be sure to consider all options before deciding where to place your above ground pool. As these are designed to be semi-permanent, you will not want easily be able to change the location of your pool once you have decided on a spot. For this reason, it is important to be sure of where you are to put your pool before you begin the installation stage. The build quality of your pool will be showcased by the type and length of warranty the company includes. A one year warranty is standard across all manufacturers. But when companies include more than this they show their faith in their own products. A 15 or even 20 year warranty on an above ground pool system is not unheard of. Some even include limited lifetime warranties on their products. You should also find out if the company has a helpline that can assist you. Some offer lifetime help calls where you can call in and ask questions about things like setting up your pool. Above ground pools may need to be looked after on a weekly basis. If you notice debris floating near the surface you will have to take it off with a pool skimmer. But for the most part, your pool’s pump will have a built in filtration system which will do this for you. The pool may also need to have its chemical system checked on a regular basis. If you are planning on turning your pool into a saltwater one this will also have to be monitored closely. Keep in mind that special pumps may have to be used if this is how you want your pool to be setup. Q: When Is The Best Time To Get An Above Ground Pool? A: While you may be tempted to get an above ground pool in the months leading up to summertime, this may not be the best time to do so. Most commonly, the months following summer, September-November, may be the best time to buy your above ground pool. Here is where you will find all the post-summer sales. You can often find above ground pools for much cheaper. The downside of this is that most pools come with only a 2-3 month warranty. If purchased in the winter months you will not be able to spot any potential problems. Q: What’s The Best Way To Fill An Above Ground Pool? A: Filling your above ground pool with water is not a hard task. All you need to do is grab your garden hose and use it to fill the pool. You will want to watch as the water starts to fill because it will build pressure as more water is put into it. If the walls seem to bulge or creak in any way we suggest turning off the water and double checking if it was set up correctly. Once the pool is filled with water it’s hard to adjust or reposition its pieces and parts. It’s much better to do it right the first time than to fix it halfway through. Q: What Is Meant By Pool Circulation? A: Pools will have built in circulation systems. This keeps the water moving as still water is a great breeding place for bacteria. If the water is constantly moving it will stop the bacteria from forming which keeps your pool cleaner and more sanitary. Q: What’s The Required Maintenance For A Pool? A: Most above ground pools don’t require much maintenance. They should come with water pumps and filtration systems that keep the water clean. If they get clogged you will have to change the filter and possibly clean the inside of the pool but this won’t happen often, if at all. Q: How Do I Level Out The Ground To Place My Pool? A: There are many ways to level the ground where it will sit in your yard. This can be done by creating a platform or digging a flat surface. It is ideal to simply find a flat area for it to rest but if there isn’t one you can take these measures. Just be sure that if you are making a platform that the base be strong enough to hold the pool. These can hold thousands of gallons of water which can be hard to support. Q: How Deep Are Above Ground Pools? A: Above ground pools can be anywhere from 42 inches to well over 60. This can vary depending on the dimensions of the pool, the manufacturer and even the materials used to make it. 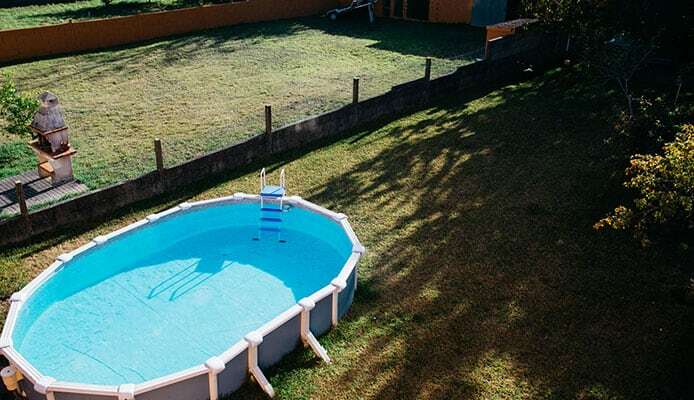 Q: How Could I Drain My Above Ground Pool? A: Draining your above ground pool is quite simple. Every pool will come with a valve that you release which will let the water out. Most will come with a place to screw in a garden hose which allows you to funnel the water into a specific area to not flood your yard. Q: Do You Need A Fence Around An Above Ground Pool? A: You don’t need a fence around an above ground pool. It can help to keep animals and people out but isn’t necessary for your pool. Due to the height of these above ground pools, you will not have the same risk of children and pets falling into the pool which makes it a much safer option. This means that you do not have to have this extra safety precaution. With the best above ground pool you will no longer have to spend time driving to the beach or your local community pool. All you have to do is walk to your backyard to enjoy the hot summer day. Once you set up your pool it’ll be able to cool you off all summer. Your family will love having a way to beat the heat this summer. Having the best above ground pool is a great cost effective way to make the most out of your summertime. Costing you far less money year after year, this is a family friendly way to spend more time in the great outdoors. Have you ever installed an above ground pool into your backyard? Tell us how you found the procedure in the comment section below.